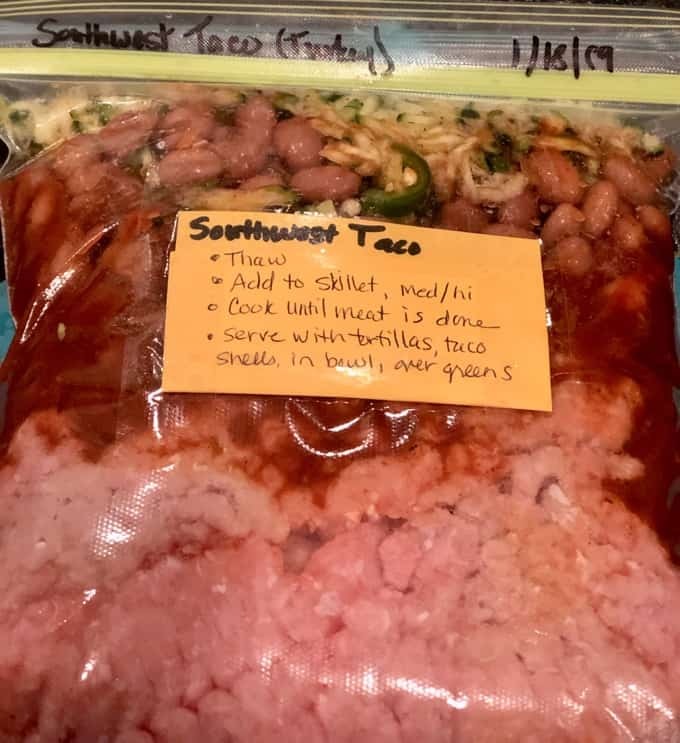 I started making healthy freezer meals for convenience when we were camping. 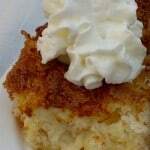 Now I find myself using these make-ahead recipes more and more at home. Being budget-conscious, this is a terrific way to take advantage of sales. When I find a meat bargain, I buy it in bulk. 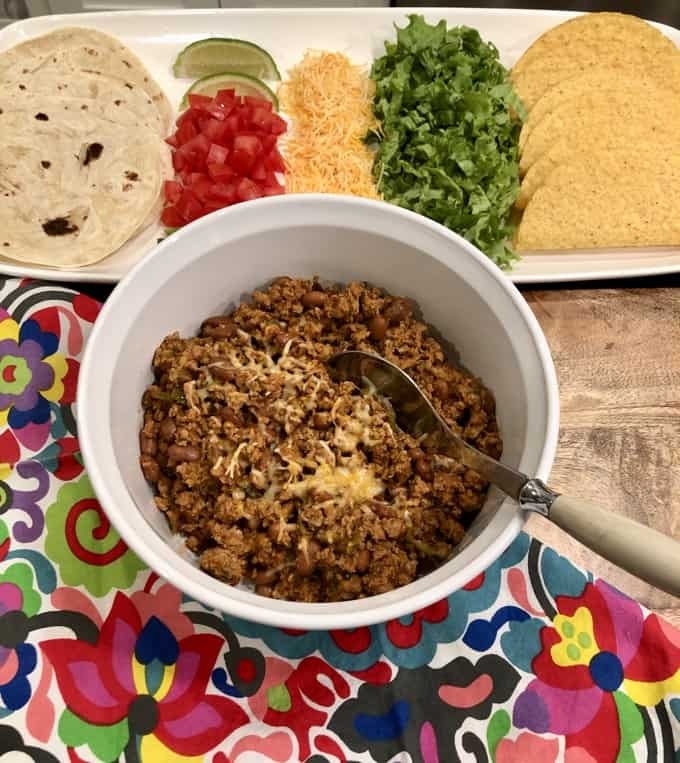 Then I prep several different freezer meals for later—like this Southwest Taco Skillet. It’s really not much more work beyond portioning out the meat to freeze in smaller quantities. 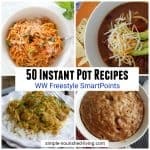 Spending a little time up front preparing these meals saves me in the long run. 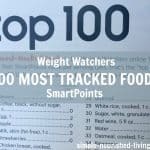 Knowing that I have meals that will come together quickly has kept me from grabbing fast food on several occasions. They are also easy for my husband to prepare. A one pan meal that cooks in 30 minutes or less is right up his alley. 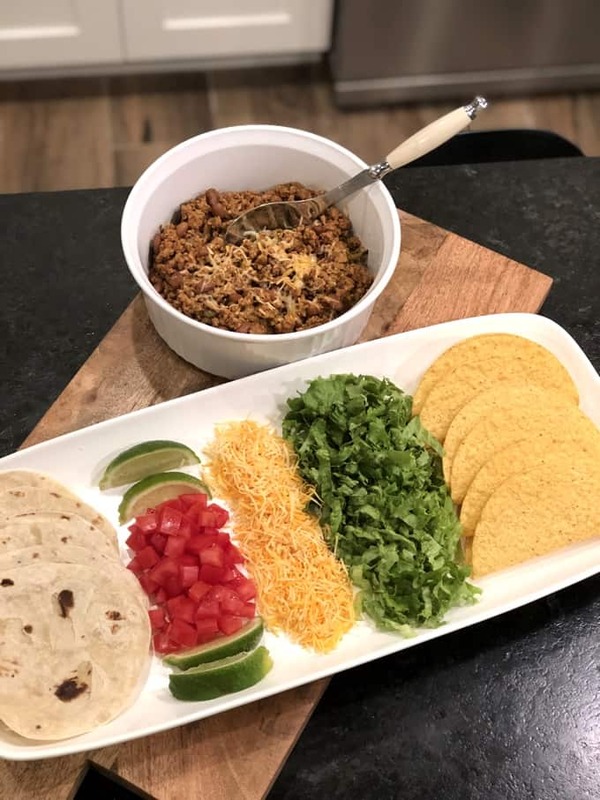 How Many Calories and WW Points in this Easy Healthy Taco Skillet? 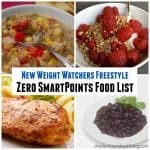 According to my calculations, each serving has 355 calories, *9 Weight Watchers PointsPlus, *4 WW Freestyle SmartPoints. Gather all your ingredients, washing and prepping (shredding, chopping, etc.) them as necessary. For this One-Pot Southwest Taco Stir-Fry, wash the zucchini and use a grater to shred 1/2 cup. Wash the jalapeño pepper, slice in half and remove the seeds and finely chop. 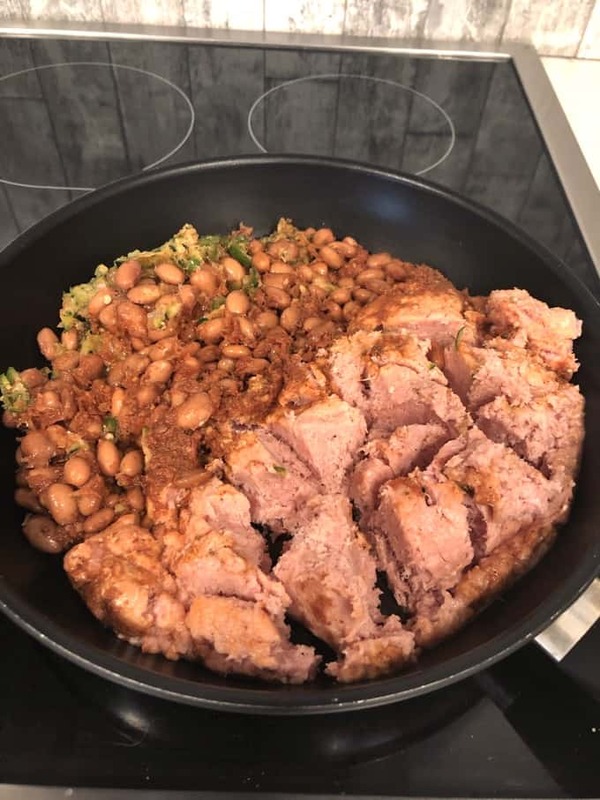 Open the can of beans and put them in a strainer (affiliate link) to drain and rinse them off. Tossing together this freezer meal is super simple. Grab a Quart-size freezer bag and magic marker (or use some paper and tape) for labeling the bag. You’ll find it to be much easier labeling your freezer meal bag while it’s empty and can lay flat! Be sure to add the date it was prepared too. Add the turkey to bag first so it takes up the bottom, then add the salt, pepper, simmer sauce, pinto beans, zucchini and jalapeño. 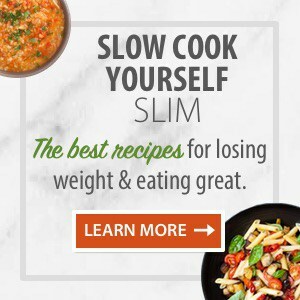 The Simply Organic line of simmer sauces (affiliate link) can be found in most grocery stores. If you don’t have the packaged sauce, no problem. Simply combine an 8 ounce can of tomato sauce, 1/4 teaspoon cumin, 1/4 teaspoon garlic powder, 1/4 teaspoon cayenne and 1/2 teaspoon of salt and mix well. If you want to spice it up even more, use 1 chipotle pepper in adobo (diced) along with 1 teaspoon of the adobo sauce. Remember to thaw your freezer meal bag for 24 hours prior to cooking. 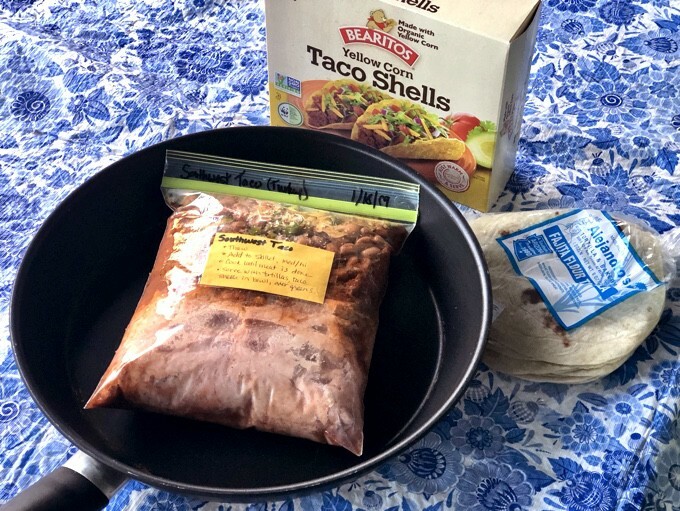 Once your bag is completely thawed, empty it into a skillet over medium/high heat. Cook for 20 to 25 minutes, or until the meat is cooked and no longer pink. When the internal temperature of the turkey reaches 165F degrees, you’ll know it is cooked through. 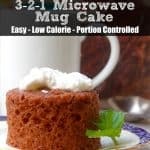 Alternatively, you can cook this in your crock pot. When the bag is thawed, empty the contents into a 4-Quart slow cooker (affiliate link). Cover and cook on LOW for 4 to 6 hours, or until done. 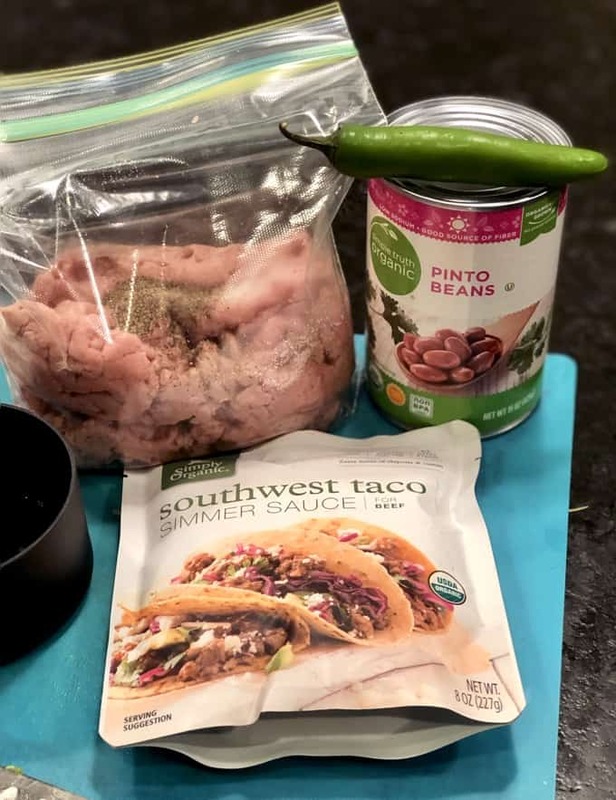 Use it as a filling to make flavorful hard or soft tacos. Use it to top a bed of salad greens, add tomato, salsa, avocado slices and a few crushed tortilla chips for a tasty taco salad. Use as a filling for burritos or enchiladas. Serve with brown or white rice and sautéed squash. Scoop it onto a baked potato. 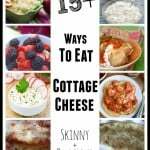 Or keep it low carb by serving with riced cauliflower or zoodles. Make a zesty southwestern soup by adding chicken broth and salsa. Top with sliced avocado and fresh cilantro. Top with fried eggs for easy huevos rancheros. Make Southwestern burgers by adding breadcrumbs and a beaten egg. Mix well and form into patties. Cook in a skillet, or grill, and serve on a bun or with lettuce wraps. 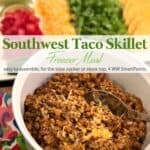 Mix with rice and use it to make Stuffed Southwest Bell Peppers. Add to melted cheese for a quick queso dip. Get creative with your leftovers. Do it your way and then share your leftover recipe with us in the comments below. 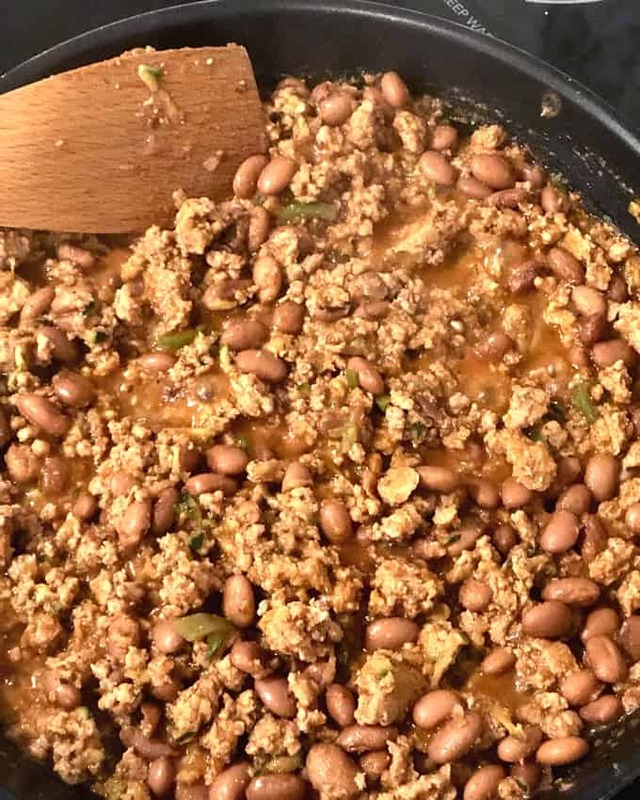 If you’ve made this Taco Skillet Freezer Meal, please give the recipe a star rating below and leave a comment letting me know how you liked it. 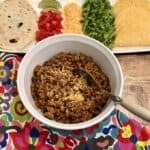 This low calorie ground turkey recipe makes a flavorful Mexican meal in 30 minutes or less. Label a quart-size freezer bag using a marker, paper and tape, or whatever you have available. Add remaining ingredients in the order listed above (salt, pepper, simmer sauce, beans, zucchini, and jalapeño). Remove as much air as possible (to help prevent ice crystals from forming) and seal the bag. Lay it flat in your freezer (at least until hardened). Remove bag the night before using and thaw in the refrigerator for 24 hours. Add contents of the thawed bag to the skillet. Cook on medium/high heat for 20-25 minutes until meat is done. Cover and cook on LOW for 4 to 6 hours, or until meat is cooked. 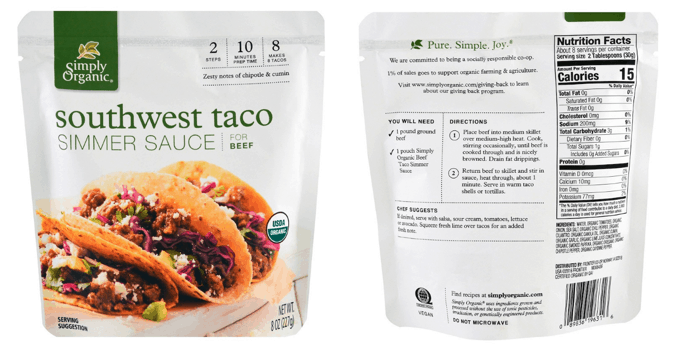 The Simply Organic line of simmer sauces can be found in most grocery stores. If you don't have the packaged sauce, no problem. Simply combine an 8 ounce can of tomato sauce, 1/4 teaspoon cumin, 1/4 teaspoon garlic powder, 1/4 teaspoon cayenne and 1/2 teaspoon of salt and mix well. If you want to spice it up, use 1 chipotle pepper in adobo (diced) along with 1 teaspoon of the adobo sauce. Thaw meal for 24 hours prior to cooking.